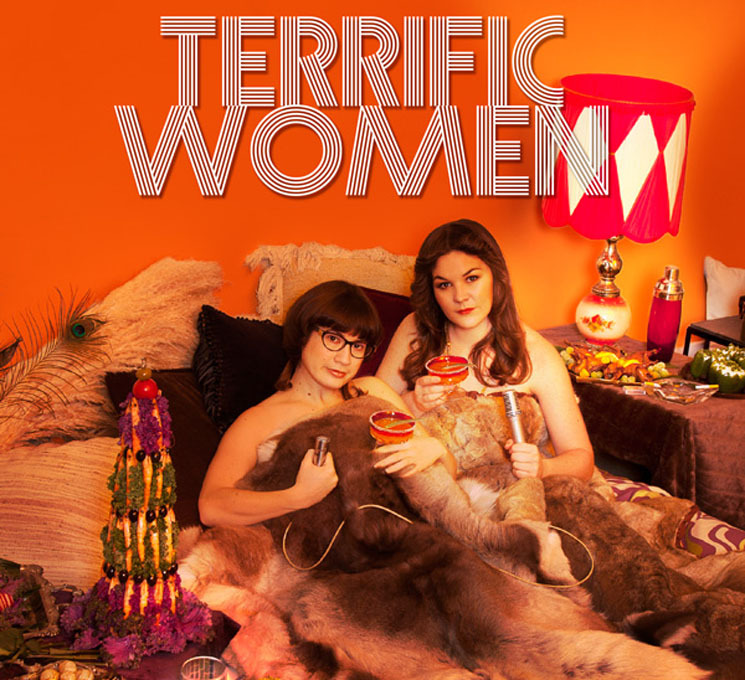 Terrific Women is a just-launched CBC web series created by Toronto comics Sara Hennessey and Stephanie Kaliner, who explore the lifestyles of two drunk and wild single ladies trying to navigate the cultural challenges they face in 1974. As Linda Davis (Hennessey) and Joy Johansen (Kaliner), the two host a late night cable access talk show that involves a lot of drinking and smoking, even for "perpetually eight months pregnant" Joy. "We co-hosted a monthly comedy show at the Ossington [in Toronto] for many years, and then we decided to work on something more conceptual, so we started hosting as Linda & Joy doing a live cable access show set in 1974 called Terrific Women," Hennessey tells Exclaim! "We'd take questions from the audience and improvise the answers, which helped us come up with jokes and bits, and further explore our character dynamics. Eventually, we decided the next step was to put together a pitch package to do the show as a web-series." It wasn't hard for two thirty-something comics to channel a decade they never experienced: "We find the aesthetic so adorably goofy and a true tickle-trunk of inspiration," Hennessey says. "Just the way we move in the clothes and our new silhouettes informed how we chatted and inspired ideas." Though they'd take in some period-appropriate content — Sonny & Cher, The Mary Tyler Moore Show, old Bee Gees videos — historical accuracy isn't a concern. "Our characters having certain things wrong actually works for our style of comedy." Their parents may not have been the inspiration for the web show's two-parter "How to Host a Terrific Key Party," but they are represented on set: "Our parents had some pretty choice décor pieces kicking around that we used for set dec."
The nine-episode first season is available now; each one runs only between four and eight minutes, but there's still plenty of time for drama. "Big time in episode seven," Kaliner reveals, "when Linda gets a visit from her ex-husband Frank (a real bad egg) and has to choose whether or not to get back together with him." Both women bring a host of comedy experience to the project: Kaliner has written on sitcoms Mr. D, Working the Engels and Schitt's Creek; Hennessey is a Canadian Comedy Award winner (Best Female Standup) and writer whose Trouble In Saradise album reached the top spot on iTunes. Check out the trailer for Terrific Women below; you can watch the whole web series here.